The holiday shopping season is officially upon us and it’s time to start figuring out what to get our friends and family. If you’re like me, you probably have A LOT of people to buy for and unless you’re a millionaire, buying gifts can get expensive! So what’s one way you can give some awesome gifts that look, smell, and feel expensive while saving some money and making you look like a Christmas Champ? Here are 10 gifts you can get me your friends and family that look like you spent a ton of money on them, when actually you spent $25 or less. Is one of your friends or family members always taking pictures with their phone, but you think their pictures could be a bit better? Help them out by getting this lens kit from StackSocial. This kit comes with a macro, wide angle, and fisheye lens, all designed to help achieve DSLR-like images without lugging around the DSLR. The lenses themselves snap on easily allowing quick camera shots that result in beautiful and captivating images. You can get this lens kit over on The Next Web Deals for $19.99 (that’s 71 percent off of the regular price of $69). Now this is really cool for any of your friends or family who like to take notes, doodle, or are serious list makers. This book has 50 pages (25 sheets) that are lined and coated with a special gloss that allows the pages to be wiped clean just like a dry erase board. The book itself is 5.8 inches by 8.25 inches (A5 size) and is spiral bounded. The pages are ruled on both sides so you can write on either site. An easy-to-clean notebook that can be used again and again makes this a very cool gift and eco-friendly too! The Mini Wipebook notebook makes a great gift at $24.99 (markers are sold separately) and are sold online or in some Staples stores. Ok, now this is cool. This little PocketMonkey can help you do many little things, all while being small enough to carry in your wallet or purse just like a credit card. With this little gadget, you have access to three different screw drivers, six different wrenches, a bottle opener, a letter cutter, a headphone cord wrap, and a kickstand for your phone. It’s super lightweight, weighing in at a flighty 0.6 ounces and is only 1 mm thick. You can carry it with you with your credit cards or leave it on your desk for a handy office tool. Made in the US out of stainless steel. You can get the PocketMonkey for $19.99 on Amazon. Now that you’ve gotten your friend the Fieldnotes guide above, help them write in it with this zero gravity pen by Fisher. I hate when I can’t write while traveling through space, but this pen allows you to write at any angle and it still work flawlessly. The pen is retractable with a large grip surface and comes in a medium point black ink. It also comes already gift wrapped, making the holidays a little easier with one less gift to wrap! Get the Fisher Space Pen from Amazon for $24.51. Help your friends and family stay organized with this 56-week planner from Field Notes. This durable, high-quality planner is designed to hold up during the years worth of use it will be sure to see. For the friend or family member who doesn’t like their calendar in their phone and still like to keep their weeks organized the old fashioned way, this is a great way to do it. This book measures 4.75 by 7.5 inches and has a 60pt chipboard cover. The pages and covers are bound with a double-o wire binding and holds 112 pages of 70# text paper, with each spread covering one week. Get this for each of your friends and family for $13.95 at Fieldnotes. This is the cutest little, non camera camera replica you could ever give your photography friends and family this holiday season. These mini camera replicas have a removable ‘lens’ that reveal a hidden 8GB USB flash drive. They aren’t partial to just one brand either: you can pick either Nikon or Canon so you can get a matching mini DSLR model to go with your friend or family’s existing DSLR. The mini camera USB drive comes with a keychain so that it can be attached to your keys or camera bag. 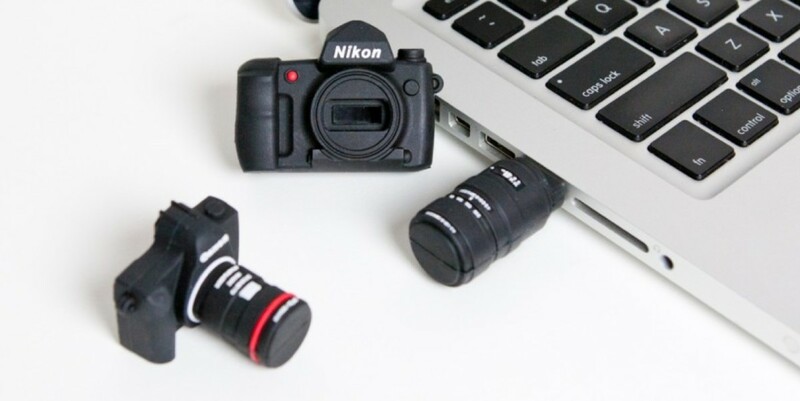 You can get this mini camera USB drive for $20.00 over on Photojojo. Know of a friend or family carrying around bulky keyrings full of keys in their pocket still? Help them out with this slim little gadget. Once launched on Kickstarter, KeySmart has become a widely popular way to carry keys without the bulk, noise, or hassle of traditional keyrings. This expanded version allows it to be used with up to ten keys and even can be used with foreign or longer keys. There also is a loop piece included so you can add your more bulkier items like a car button key. These are handcrafted in the US. You can check out the KeySmart over on The Next Web Deals for $15.99, which is 30 percent off the retail price of $23.00. The weather is getting colder, but that won’t stop us from using our cell phones and other touch screen gadgets. Using gloves with these gadgets is a pain, but it doesn’t have to be. These single layered touchscreen gloves solves the problem of using your devices and keeping your hands warm at the same time. What makes these gloves different is that they’ve designed them specifically for touchscreen devices. There’s an anti-grip grid on the palm to keep you from dropping your phone. Another great feature is that the entire glove can use the touchscreen, not just a few fingers. While it is slightly over $25, you can purchase these gloves for $26.39 on Mujjo. Have you heard of Trunk? If not then let me introduce you. Truck is a charging cable that doubles as a stand. It’s the perfect way to connect your phone via Lightning or USB to charge your phone anywhere without dealing with messy cords. Use a Trunk on your laptop to charge your phone or use it as a second screen, or even use Trunk in your car to charge your phone while bending it just right to make it usable as a car phone stand. You can get this for your tech savvy friend or family member for $19.95. Help your friends and family turn any smartphone into an immersive entertainment experience with the Google Cardboard. With a few simple steps, then inserting a smartphone, you can experience virtual reality very affordably. The new Google Cardboard was introduced in 2015 and can support smartphones with screens up to 6 inches. New to Google Cardboard is a button that works on any smartphone. Get your friend or family Google Cardboard for $23.95. I couldn’t end this list without a prank gift. Here’s the best way to prank any of your geeky friends or family. The USB Pet Rock works with any computer OS without any special software. Simply plug it in and it is automatically good to go. No need to feed it, water it, or care for it. It will instantly make your friend or family member the coolest person at the office. It draws no power, is about 4 inches by 4 inches (fits comfortably in the palm of a hand), and comes with an 18 inch long USB cable, allowing your friend the room and flexibility to pick up and play with their rock any time. You can get the USB Pet Rock for $7.99. Need more inspiration? Find even more affordable gifts in our under-$20 collection. TNW Deals is the marketplace for digital tastemakers. Get distinctive apps, gadgets, and digital resources at up to 90% off.